The Gianni Ferrari PG Series 2 collection mowers include various models and options to suit the demand of the job at hand. The range comes in 2WD or 4WD, Petrol or Diesel, either low of high dumping and more. Several attachments can also be fitted which increase the flexibility of the machine. This range is for the very large jobs where 800l catcher capacity will really get a work out. Due to the wide choice of versions and attachments, PG machines are able to provide solutions to the most varied operational needs and allow professional landscapers to be immediately productive. A true multi-purpose performer. 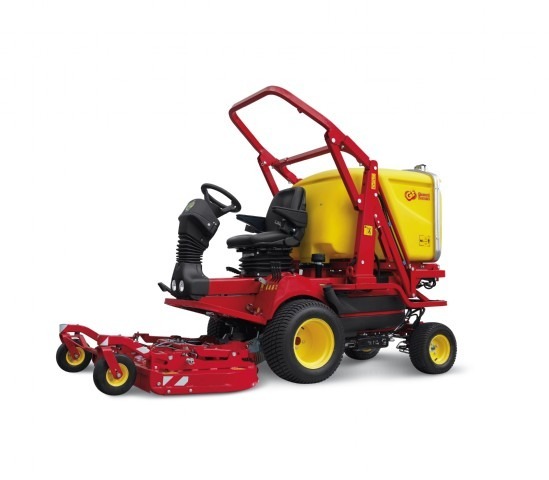 PG front-mounted mowers are designed for the cutting and simultaneous collection of grass. Because of this, the collection system is built into the machine, with the steel blower and the collection tube located inside the traction unit. hopper are always available to be used with other attachments. A wide choice of high performance and reliable engines are available. 3-cylinder liquid-cooled diesel engines are installed lengthwise in the rear of the traction unit. The radiator vent blows towards the rear of the machines. This allows the operator to be located away from heat and keeps the radiator clean for longer periods. 2-cylinder air-cooled on PG 230 model. In order to meet the specific requirements of each operator, PG range offers a wide range of mower decks which suit a wide variety of operating conditions. Cutting and collection decks are available in 112 cm, 126 cm and 130 cm. Decks for cutting without collection, or for mulching, are available in 130 cm and 150 cm. PG machines are equipped with hydrostatic transmission, with the pedal feed allowing the operator to vary speed from 0 to 14Km/h (4WD version). In difficult conditions (uneven ground, slopes or poor traction) the differential can be locked to ensure the same drive on both front wheels, thus improving the control of the machine. The hydraulic steering acts on the rear wheels and ensures precise and rapid changes of direction, while simultaneously reducing the operator effort required. PG machines come in a dual tail wheels (3-wheel) version for an extremely small turning radius and great agility, and in a 4-wheel version with a rear floating axle. This version ensures a reduced turning radius and provides stability and safety especially when the operator drives across slopes. It ensures that traction is still supplied to all four wheels, even during turning operations. This is a major safety advantage over some other solutions on the market which actually disable the 4WD capability when the operator initiates a turn. PG machines have been designed and manufactured in compliance with the strictest safety directives of the European Union and other International Standards bodies. Large front lights allow for safe operation even in situations with reduced visibility. Therefore the machines are productive throughout the day. The low barycentre and the proper distribution of weights on the axles also offer great stability to the machine. 4-wheels diesel PG models supplied with a “kit for road use approval” (front and rear lights, indicators, flashing beacon, horn, etc.) can be used on roads. Depending on the approval received, it is possible to drive on roads either with the mower, or with the equipments stated in the vehicle registration document or with an empty or full hopper. The control and indicator dashboard is located directly in front of the operator. This ergonomic solution provides for easier use and more control of the unit. A digital display provides information on the general operation of the machine (hour meter, engine water temperature, fuel reserve etc…). It also acts as a diagnostic fault-finder should any problems occur (PG 230 excluded). The seat can be adjusted to fit the height and weight of any operator. The height and rigidity of the seat springs can also be adjusted. All controls are located within easy reach and the hydraulic distributor levers are protected from accidental operation. All equipment and cutting tools are in front of the machine to guarantee the utmost visibility and control for the operator. The front deck ensures that the grass is cut before being trampled by unit wheels resulting in a clean, even cut. bushes and makes finishing around trees, flower beds and walls easier. PG machines are fitted with a hydraulic front lift for decks and attachments. This enables the machines to mount kerbs and other obstacles. It also allows for easier access for maintenance. The installation of all the attachments is quick and can be performed without using any tools. Emptying the hopper is performed via dual hydraulic cylinders, which make dumping a fast and easy operation. The large 800-litre hopper is manufactured using a very strong, shock-resistant material. It is fitted with a filter, deflector chute and a warning buzzer that signals when the hopper is full. The filter is easily removable for easy cleaning; it is a steel mesh that prevents grass from escaping, yet it ensures positive air flow ensuring that the hopper is filled to capacity. The audible warning advises the operator to disconnect the PTO (Power Take Off ) when the hopper is full, thus preventing the obstruction or clogging of the collection tube. The deflector chute inside the hopper is covered with a metal plate that prevents abrasion. The anti-shock external frame is made of steel tubular and protects the hopper and fairings from the impacts that frequently occur when working in confined spaces or close to obstacles. 4-wheel PG models can be fitted with a lift elevator. By means of a hydraulic operation parallelogram system, the hopper can be lifted up to 1,95 metres to dump the grass directly into a truck, trailer, skip or bin. The hopper can also be emptied at any height that is lower than the maximum, due to the independent dumping control.